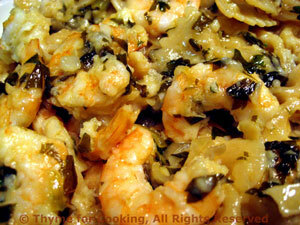 Shrimp Persillade over Pasta, Thyme for Cooking easy main course. Even people who do not like escargot can't resist dipping a bit of fresh baguette into the garlic parsley butter, or persillade, that's left in the little cups. Expanding on that wonderful taste we added shrimp, a few shallots and some Parmesan and served it over pasta. Clean shrimp if they need it. Sauté bacon in a large nonstick skillet over medium heat until crisp. Remove and set aside (don't eat). Drain off fat. Add butter and oil to skillet, heat. The oil helps to keep the butter from browning. Add shallots and garlic and sauté over low heat, stirring occasionally, about 10 minutes. We don't want them to brown, just to cook slowly. Add the parsley and continue to cook slowly another 5 minutes. Turn the heat up and add the shrimp, cooking until shrimp start to curl and turn opaque. Reduce heat and add white wine, bring to a simmer. Crumble bacon and add to pan. Stir to combine. Pour over hot pasta, add Parmesan and toss to coat. Serve.